As I had to be in Jersey City for an early meeting, I could not miss an opportunity to go to Choc O Pain, a few steps from the Grove Street Path Station. 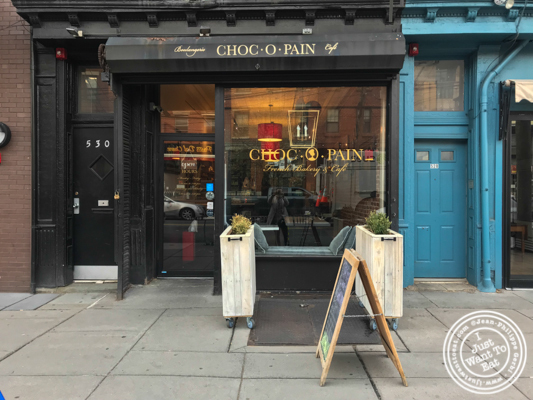 Smaller than its sister bakeries, Choc O Pain has a nice neighborhood feel, with a rusticity that gives some coziness to the whole place, an a French touch from food to music. Menu wise, there is no surprise there, with the usual French viennoiseries (croissants, chocolate croissant, brioches...) and sandwiches. When we arrived, the place was empty but it filled up quickly right before 8am, not surprising considering how good this place is.. And no, I do not own any part of it: I just love it!! !